As many on these pages are all too aware, it takes hundreds leading to thousands of hours of schutzhund training to properly prepare a dog for higher level competition; but that is not nearly enough. What it absolutely takes beyond the aforementioned dedication of time is club, club, club; and, I’m not talking about the proverbial “seal bashing” kind. There isn’t a single top level competitor in the history of our sport who did it themselves without the benefit of a supporting schutzhund training organization and quality helper work. For most of us in the sport, that means the additional requirement of quality schutzhund training helper work. I am very fortunate to have an exceedingly supportive schutzhund training club in Hundesport Alaska and their training directors Shaun and Bridget Lytle. They allow me the flexibility to sometimes train in methods outside of their “system” and the additional time and guidance required to prepare for “beyond club level” competition and travel. My home club and I are additionally most fortunate for the high level excellence in schutzhund training provided by Mark and Ann Marie Chaffin. The leap from a good or very good club to one that could prepare a competitor for the podium is quantum. The Chaffins have allowed me many, many months of schutzhund training with them to hopefully ingrain not only how to compete well with my current dog but hopefully highly with the next. 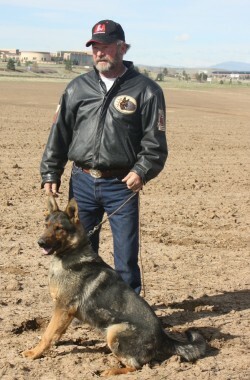 Mark Chaffin is a schutzhund training teaching helper who has never received his “proper” due. His first love is preparing others to succeed and even to this day that priority often infringes upon his own preparation with his current world class capable dog. Of course, I benefit from that and cannot express enough my appreciation for Mark’s dedication to me and others in the sport to the detriment of himself. I have had the privilege of seeing and/or working with several top notch, “name,” trainers who’s work I would one day like to emulate; but even among them, Mark’s schutzhund training ability is uncanny. I admire him greatly. This is a shameless plug, but I am going to do it anyway. Many, many competitors have traded the fame they acquired by reaching the podium into dollars from training videos. Some are quite good; others are not. But, I have yet to see a series that even approaches the usefulness both to clubs and individuals of those the Chaffin’s are accumulating at www.TopSchutzhundTraining.com. The raw footage and narration is a glimpse into the gist of Randy’s question “what does it take.” What is most beneficial is that it presents the “whole picture” of training required for higher level success that I assure you the “big name” producers of these videos are leaving out. That “it take a village” in our sport may be cliche, but it is oh, so accurate… I love Schutzhund Training.